Here at Puppet Place we are invested in supporting the puppeteers of the future. To do this we’re building a programme of workshops for children and young people. 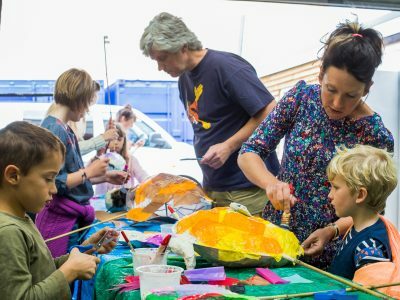 This Easter we are running Pop-Up Puppet Club sessions for children aged 4-6 and 7-11 at Underfall Yard in Bristol; these workshops are a collaborative, creative time for children, families and young people to explore their crafty side in a relaxed, supportive environment. We’ll be reading stories, playing games and making puppets all based on creatures living in or near our rivers. We like to keep these workshops low cost and to do this we need your support. If you would like to help us develop fun, interesting and educational workshops to tomorrow’s puppet makers then please donate below.